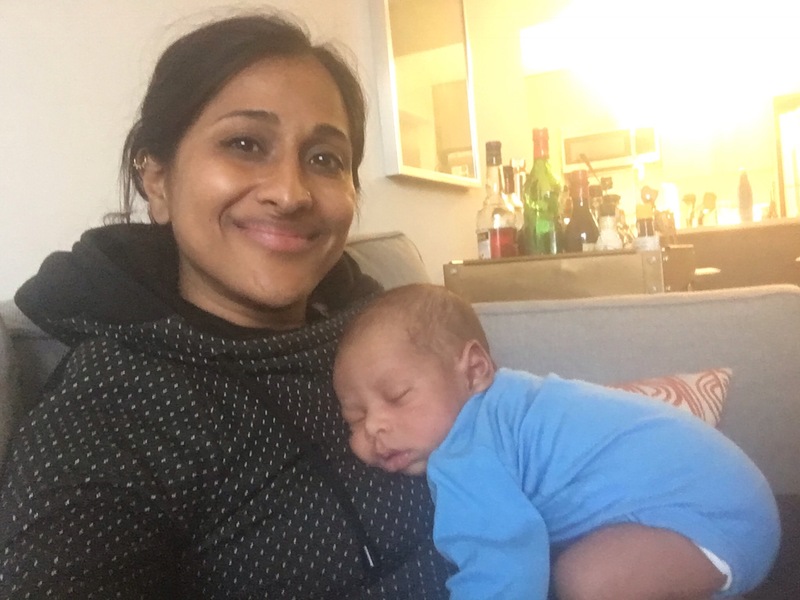 A few weeks ago I took a short trip back to America, to visit my sister and my brand new nephew! I thought he was pretty cute. Here he is in some of the handknits I’ve made for him, and there will be more. 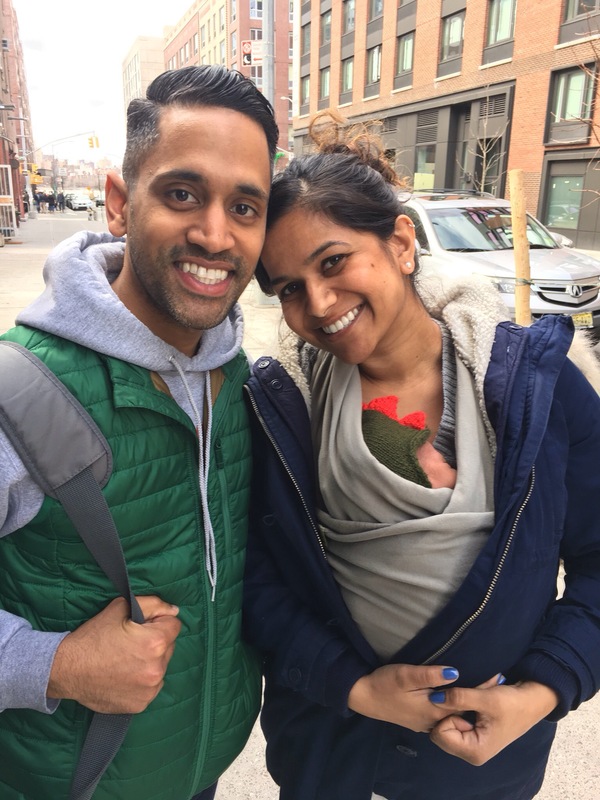 Being with a newborn again makes me reflect on parenting in general, especially as my children start to begin the process of pulling away even more. Your baby is wholly dependent on you for care and often for food, and you are quite literally their whole world. You’re physically in contact with your baby for most of your waking hours, and often much of your sleeping hours as well. Over the years that changes, to where the kids separate more, to feeding and toileting themselves, dressing themselves, and to now where there are large swaths of time where I have absolutely no clue exactly where they are or what they’re doing. At night, we still have snuggle time where I crawl into bed with the kids and we chat for a bit before I kiss them goodnight and they go to sleep. I sense, however, my time doing this is coming to a close especially for my older one. At some point it’ll feel weird and I don’t picture myself getting into my 16 year old’s bed to snuggle anymore, just maybe a kiss on the forehead if that. It’s bittersweet, to be sure, in that I’m happy for this independence and I certainly wouldn’t want it differently, but the difference is stark and made me nostalgic for those heady early days, where despite the sleep deprivation and difficulties, you had a tiny little being that only wanted to cuddle in your arms all day long. Being back in the States was fantastic. It can get wearisome to always feel like a stranger, so to be in New York where I just understand how things WORK was such a relief. I was also lucky enough to have friends who could travel to see me and got to spend time with them, and marvel on what good friends I have. 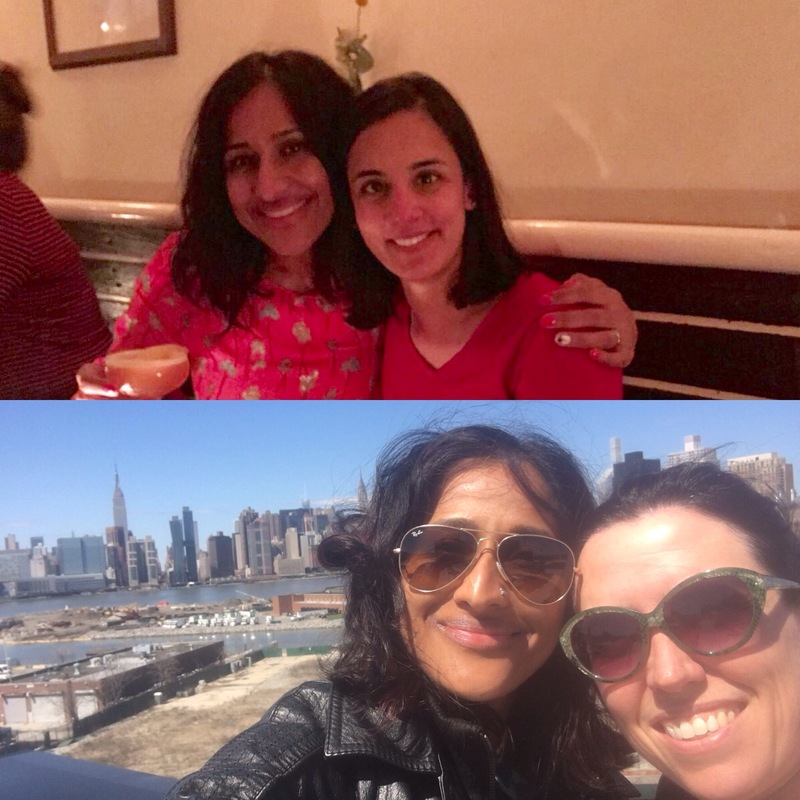 This was soul-reviving, to be with people who I could just relax with instead of having to feel like I was “on,” and I’ll admit that I was feeling quite homesick after the journey. Back in Ireland, I returned to spring break and a trip out west. First stop was to get the rental car from the airport. Eric had made the reservations and so went to pick up the car, but when he arrived, it turned out that his US Driver’s license had expired! Of all the details to overlook. So out I went to fetch the car, and did all the driving along the way. We did upgrade to an automatic transmission, which I was glad of after I nearly got into an accident on the way home in one of the roundabouts. Tricky things, those are. As I sat down to write this blog post out, I looked through the pictures I took of the trip. For once, there just weren’t all that many. I wish I could tell you that this was due to some nobler purpose of being so involved in the moment that I couldn’t pull out my camera, but I feel the truth is simpler – I was feeling a bit travel weary on this trip. It’s a complicated moment in our time away, where I’m simultaneously itching to move again, bored with being in one place, and yet tired of feeling like we’re on a trip. That’s not to say that we didn’t enjoy this leg to see more of Ireland, but we couldn’t help but feel that we would have enjoyed it more from a warm beach, with an umbrella-garnished cocktail in one hand. 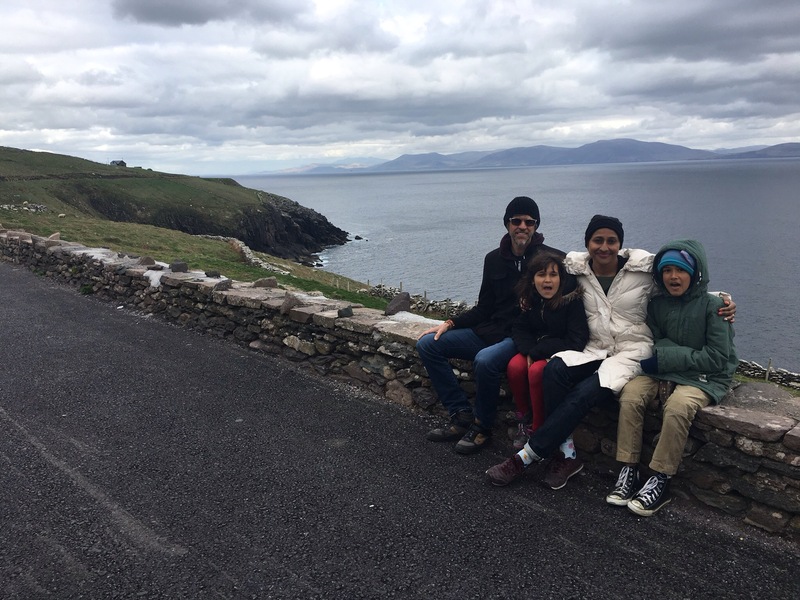 We started in Dingle, a peninsula on the southwest coast. We checked in to our hotel and started chatting with the proprietor about living in Maynooth and the kids being in Catholic schools, given that it was Easter weekend. She asked, “If you don’t mind, what religion do ye follow?” I didn’t mind at all, shrugged my shoulders and replied, “We’re really not religious, don’t follow anything in particular.” At which point the girl piped up and said loudly, “We’re Pagan!” as the boy nodded vigorously beside her. The hotel owner looked simultaneously shocked and entertained, I tried to correct the kids but they kept insisting that they were indeed pagan as they believed in the Norse gods, and Greek gods, and Hindu gods, and what have you. I suppose this summer we’ll be dancing around the Beltane fires at this rate. 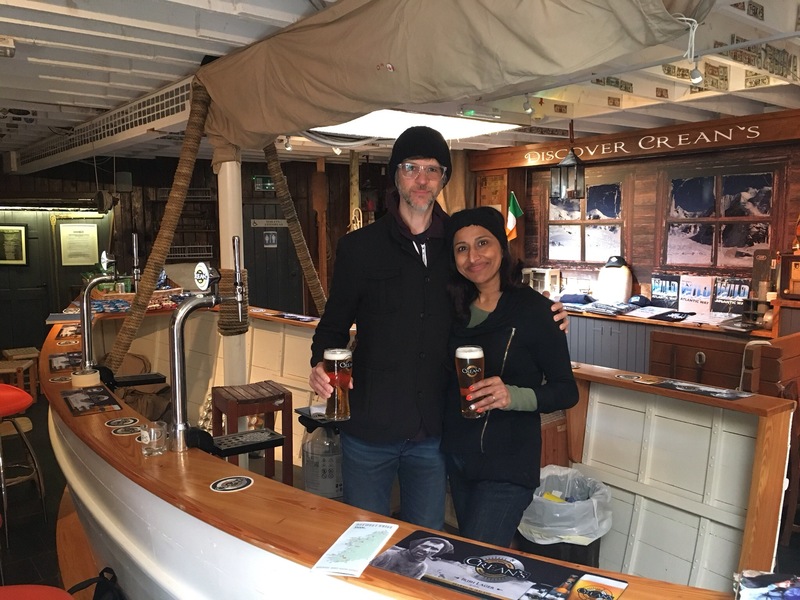 A favorite stop was the Dingle Brewery where we had a glass of Crean lager and chatted with Paudie, whom the girl informed “had a name that sounds like ‘bathroom’ in America.” Awesome. She’s making friends all over this island. Tom Crean is a local hero in Kerry, and rightfully a proper badass. Known as a famous Arctic explorer, he took three separate trips to the South Pole in the early 1900s, was turned around each time, dealt with frostbite, starvation, team members dying, and at one point walked solo across the ice for 35 miles to save a colleague. After the last trip he returned to Kerry, settled down to raise three children and opened a pub. I’m happy to report that the lager brewed in his name is quite delicious, made from spring water near the brewery itself. I don’t know if I’ve ever had a glass of fresher tasting beer, and it made me appreciate lagers again after years of being an almost exclusive IPA drinker. Next was a drive northward to Westport, where we stopped in at the stunning Cliffs of Moher along the way. Also known as the Cliffs of Insanity from the Princess Bride, or the Horcrux cave site from Harry Potter, a sheer 600 foot drop from the edge to the ocean is carved out of rock. A signboard tells you of the types of birds that nest on the cliffs, and upon seeing this I yelped “PUFFINS!” so loudly that Eric jumped. Like daughter like mother, I suppose. Thankfully, we were well inland when this happened, else he might have had a long journey down. I was so excited to possibly see a puffin (puffins!) but alas, they had gone sea fishing in the afternoon and I was disappointed. You know you’re not in America when there’s nothing to block you from a cliff edge other than a few signs that warn “danger” in a half-hearted way. The next day the girl woke with a fever. 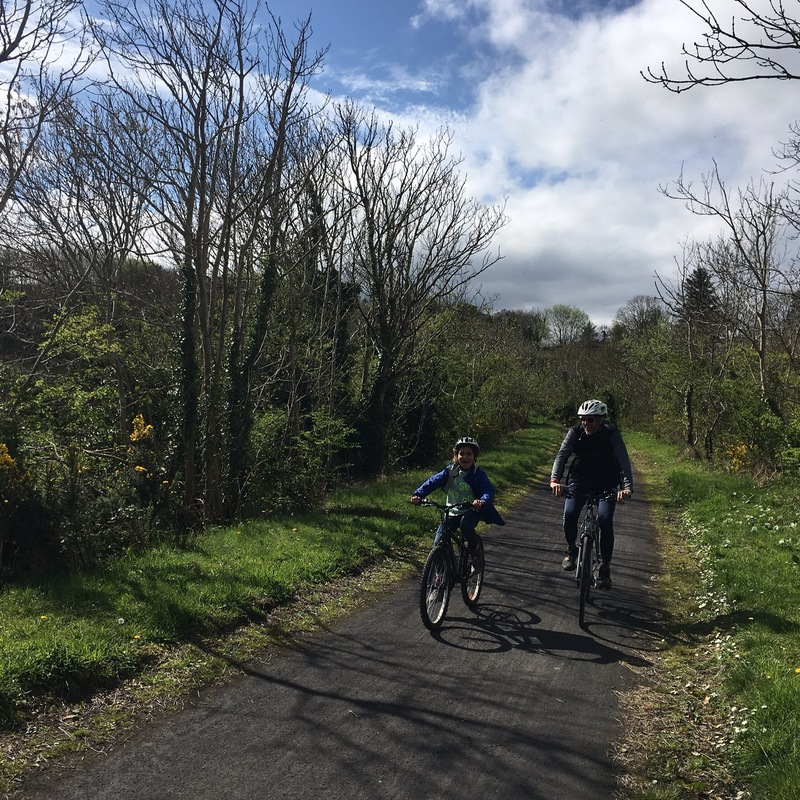 Because I’m a medical parent, and I have little sympathy unless you have an obviously broken bone or an active hemorrhage, we popped a few ibuprofen into her, proceeded to rent bikes and took off on the Great Western Greenway. This is a 27 mile long trail from Westport to Achill island, with exit points along the way. We decided to go for the 19 mile section and take a shuttle back. It’s almost all entirely car-free, which is a rarity for cycling here and was utterly gorgeous. The mountain Croagh Patrick is in the distance, and all about you are peaceful rolling hills and grazing sheep, goats, and some curious cows. Around mile 15 of 19, the trail became almost entirely uphill, and the girl may have wept a bit at this point. We may have said things like “Come on, we just have to keep pedaling!” and she may have wailed back “Fine! Fine! Just leave me behind!! You don’t even care about me, DO YOU?!? 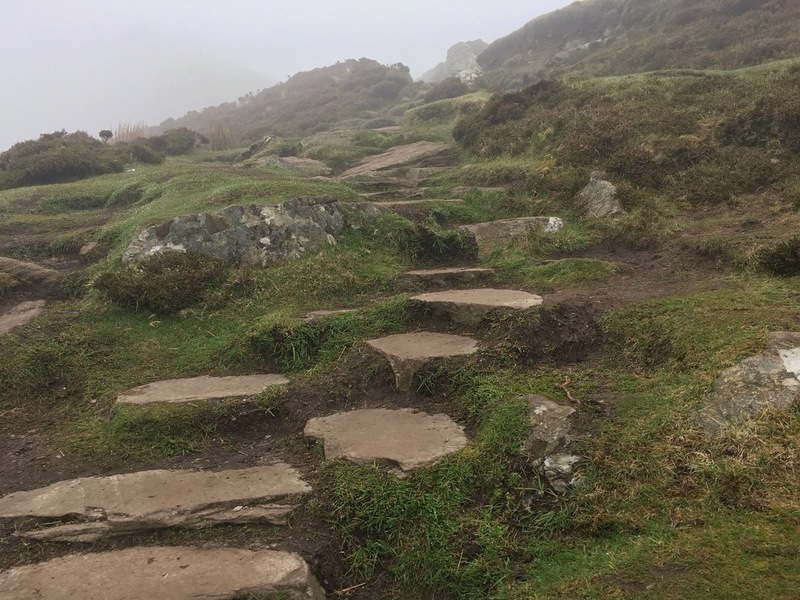 !” After about a mile of this, however, the trail again turned downhill, she hopped on and returned to her usual sanguine self. I swear, I don’t know many adults who would have been able to do what she did, she is so, so tough. Our last stop was to Donegal on the Northwest coast. 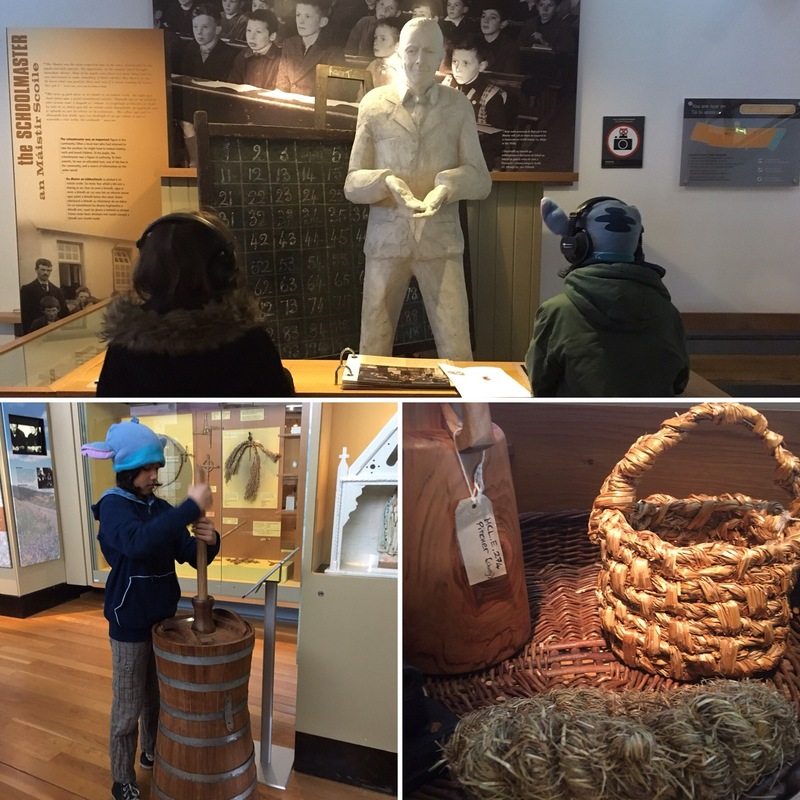 Along the way, we stopped in at the Country Life Museum. I’ll be honest, I was expecting a dark room with a butter churn and walls covered in text, as I’ve seen in some other museums. This is however an incredible place. 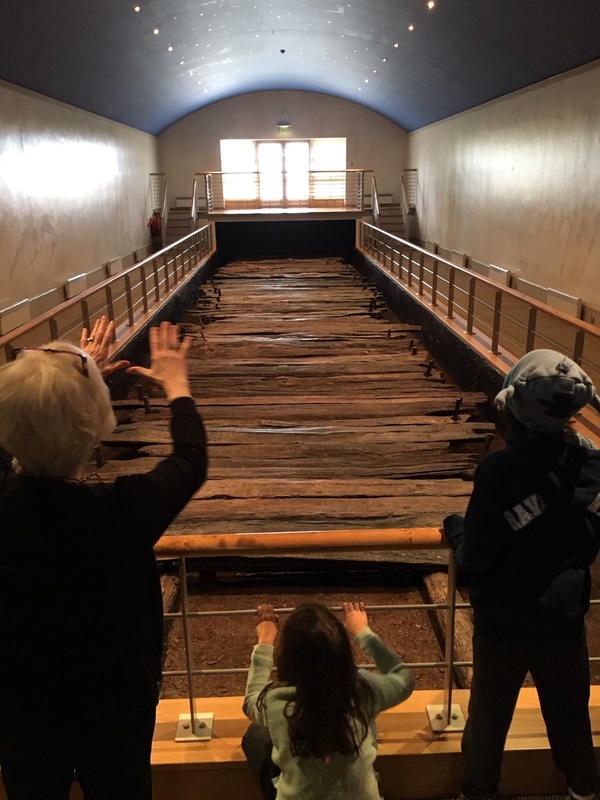 Displays about Irish rural life from prefamine to the 1960s bring to life what was clearly a very difficult existence. I felt like I was walking in a real life “These are the people in your neighborhood” song from Sesame Street. 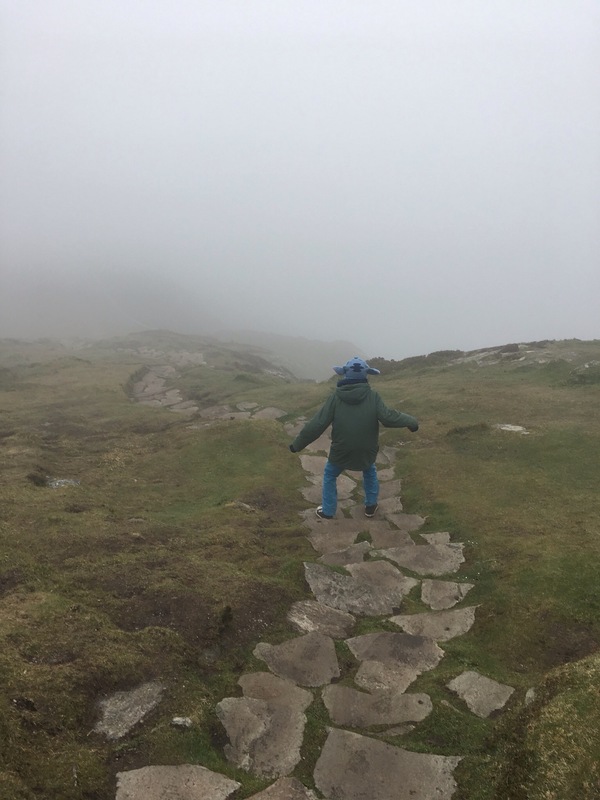 We tried to hike up Slieve League the next day, but were stymied by fog. Another high cliff like those of Moher, there’s supposedly a gorgeous view up there but it was not to be for us. I looked for signs of puffins as well, and again they were not to be. The Donegal Yarns workshop was a delight. Rooms filled with beautiful yarns and handwoven and handknitted scarves, sweaters and hats. Fun fact: most wool in Irish products does not come from sheep living here, and is imported from England, New Zealand and Australia. One Irish season is enough to turn the softest sheep’s wool into Brillo pads, and as such the wool is exported for upholstery. Most of the adorable lambs you see tottering about on the side of the road are fated to end up on your dinner plate in the next few weeks. Upstairs is the weaving room, where fabrics are created as they always were, on long hand looms with foot pedals, by one person at a time. Behind that is the spinning room, where the dyed fleece comes in and is mixed into skeins for the weaving, and then the sewing room where the fabrics are made into their final product. Here he is in action, the rhythmic click clack of the loom with each shuttle pass taps out a cadence for him to follow. Unfortunately, the sound didn’t record so you’ll have to use your imagination. 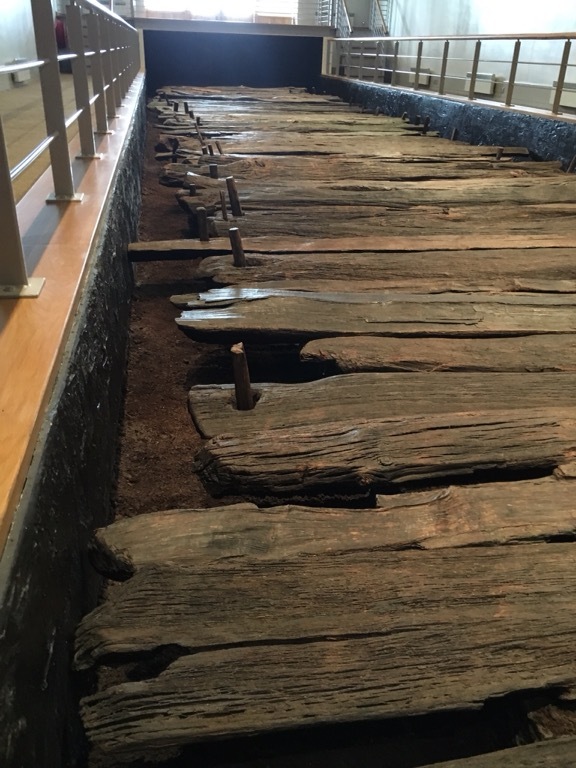 On the way back home we visited the Corlea Trackway Museum, where an ancient 2000 year old wooden bog trackway has been preserved. 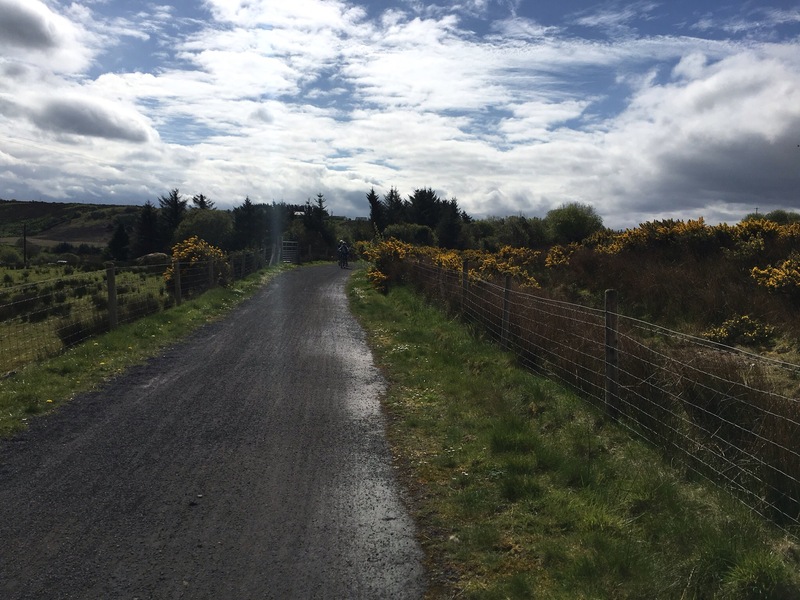 No one knows what this road was for – there are many such roads along the spongy bogs, which were heavily trafficked as ways to cross over without sinking into the sludge, but this one remains pristine. It was a long road, and took months and many people to construct, and as such is a mystery as to why, after all that work, it remains unused. We’re back in Maynooth now, and glad to be here. We pulled up in the rental car, I dropped Eric and the kids off to go and return it, and when I got back the kids were nowhere to be seen, having run off to join their friends somewhere in the green of the estate. I think I’ll have a glass of the Crean’s lager we brought back with us. Oh. No puffins. Twice Nate and I have traveled in hopes of seeing puffins and twice we’ve missed them. I am sad that I cannot even live vicariously through you. Wily puffins. I’m sad you are homesick, but honestly, how could you not be? I think missing people would be the hardest…. lovely post and thanks for sharing your adventure. GAH – I miss you guys so much. I know exactly what you mean about the snuggling part. We’re still on it, but for how much longer?